Look for Less! Dupe Alert? Welcome to another edition of The Look for Less! Since I have so many polishes in my collection, there are times that I’ll come home with a polish and look at others in my collection and realize that I already have something similar. That happened to me this past fall when I bought Butter London “Queen Vic.” I was absolutely obsessed with the berry purple shade, until I realized that I already had something similar. I picked up Zoya “Sofia” over a year ago and fell in love. I had to know if the two shades were really dupes of each other so I compared them side by side. Keep reading to see if they really are dupes! As you can see, they aren’t dupes. But they’re pretty dang close! So close that I don’t think you need both. 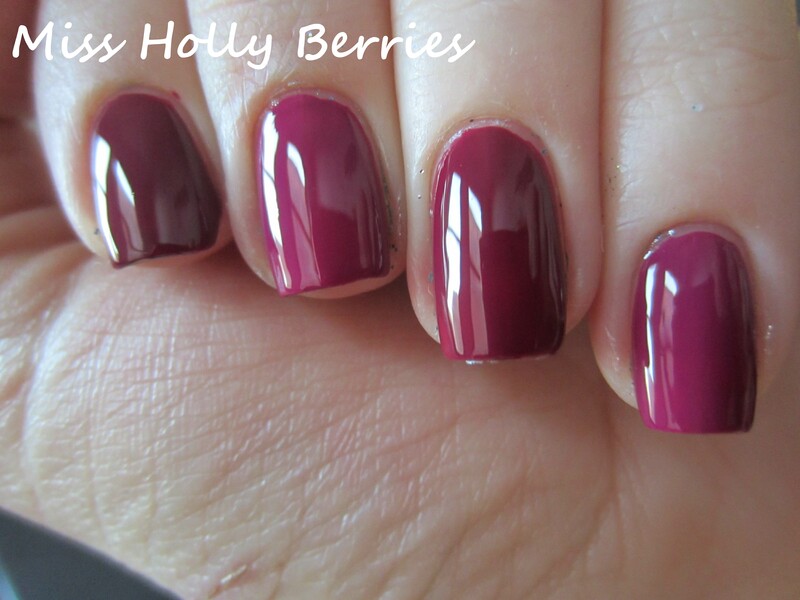 Formula wise, these polishes are pretty identical. They are almost opaque with 1 coat, but do require 2. They both dry really quickly and dry to a really glossy finish. Which one do I like better? Its a toss up! Since the formulas are pretty much the same its all a question of color. Queen Vic is slightly more purple and berry toned, and slightly lighter. Sofia is a little darker and has more red to it. I like both, but I don’t need both. Which do you prefer? Do you have either of these? Ooh, both of those are right up my alley. I love berry colors. Hmm, I’ve just discovered you can reblog on WordPress. Are they trying to turn it into something like Tumblr? — Well, anyway, berry-colors are one of my favorites, and I’d never seen either of these two before. no problem and the zoya one is awesome! and its definitely cheaper! omg thats awesome!!!!!! i can’t even type as many exclamation points that i want to for this!!! that would be like my heaven to walk into that store!